Published Jan 18, 2013 by Addison-Wesley Professional. Part of the LiveLessons series. The goal was not to be exhaustive, but rather, to provide a higher level view of how all the pieces of a big data architecture work together. Paul Dix is the author of “Service Oriented Design with Ruby and Rails.” He is a frequent speaker at conferences and user groups including Web 2.0, RubyConf, RailsConf, The Gotham Ruby Conference, and Scotland on Rails. Paul is the founder and organizer of the NYC Machine Learning Meetup, which has over 2,900 members. In the past he has worked at startups and larger companies like Google, Microsoft, and McAfee. Currently, Paul is a co-founder at Errplane, a cloud based service for monitoring and alerting on application performance and metrics. He lives in New York City. 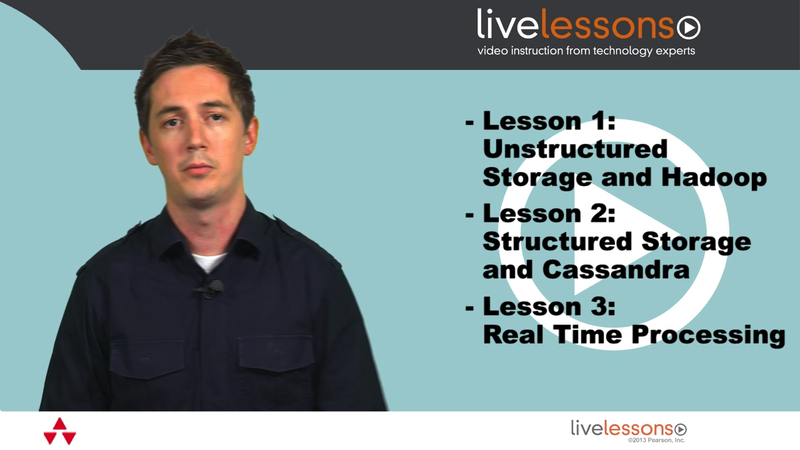 In Structured Storage and Cassandra you will set up Cassandra, learn how to model data in Cassandra's column oriented storage, use Cassandra from a Ruby library, and write data into Cassandra from a Hadoop map reduce job. Real Time Processing and Messaging is about real-time processing with messaging systems. Specifically, you will learn about Kafka, an open-source distributed messaging system. You'll install Kafka, read and write data from the messaging server, write data into Hadoop, and learn how to mplement highly available and scalable message consumers.